Kabocha squash is also called a “Japanese pumpkin” – it is an Asian variety that is squat and looks like a green pumpkin. 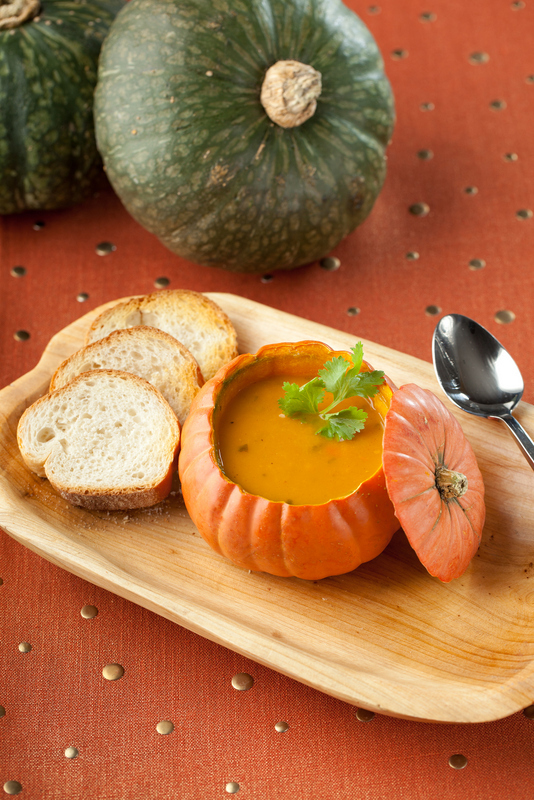 With it’s sweet, creamy flesh, it is a great choice for soups, purees and stews. Line 2 baking sheets with foil and grease. Cut squash in half and scoop out seeds and fibrous strings. Place squash halves cut side down on baking sheets. Roast for 1 hour, or until tender when pierced with a fork. Remove from oven and cool. Scoop out flesh from squash halves, transferring to a bowl; set aside. Add onion, carrots, and celery, stirring to coat vegetables. Sauté for 5-7 minutes, until onions are translucent. Add reserved squash, stock, water, ginger, and spices. Bring to a boil. Reduce heat to low. Cover and simmer for 30-40 minutes. Remove from heat. Using an immersion blender or food processor, puree soup (this might have to be done in batches if using food processor). Add coconut milk, honey and lime. Stir to blend. Season to taste, adjusting seasonings as needed. Serve hot, garnished with minced cilantro.